167 out of 279 sessions attended. 7522 out of 10112 votes during the mandate. Positions of PHILIPPOT in EP general rankings. Weighted estimate of activity calculated for PHILIPPOT is 346.75 (+info). Mean productivity calculated for PHILIPPOT is 2.82 (+info). Tables below show current number of activities registered by PHILIPPOT. 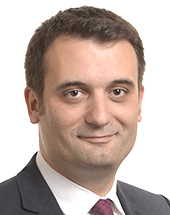 Values of Florian PHILIPPOT for each activity. Average of EFDD in France. Average of EFDD in the European Parliament.